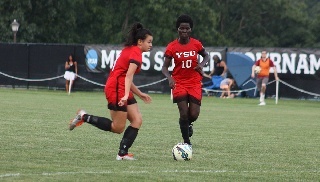 Moon Township, Pa. -- Junior Kyler Lum scored in the 63rd minute of the match and senior goalkeeper Katie Montgomery posted her fourth career shutout to lead the Youngstown State women's soccer team to a 1-0 win over Robert Morris in the 2016 season opener. The win also marks Fabio Boateng first victory as the Penguins' head coach. Lum broke the scoreless tie with her fifth career goal in the 63rd minute. After receiving a centered pass from freshman Larsen Murvin, Lum beat several Colonial defenders with some nifty footwork and placed a shot past Makenzie Shearson into the right corner of the net. The Colonials peppered Montgomery with 14 total shots, seven in each half, and nearly tied the game with 2:48 left in the match. The Penguins committed a foul just inside the 18 and set up RMU's Erin Ritzer with a penalty kick. Ritzer's attempt bounced off the crossbar and was cleared by Montgomery, but Ritzer blasted two more shots that were blocked by Sophie McFarland and helped preserve the win. Junior Marissa Martin nearly gave the Penguins a 1-0 lead just eight minutes into the match. Martin beat the RMU goalkeeper to a loose ball in the penalty box but her off-balance shot went wide right. Martin was denied again in the 55th when Shearson blocked a one-on-one shot over the crossbar. The Penguins finished with 11 shots, six shots on goal and four corner kicks. Martin led the squad with three shots while Katie Hackos and Alison Green each had two shots. Youngstown State returns to action against Central Michigan, Friday, Aug. 26, at 6 p.m. in Mount Pleasant, Mich.